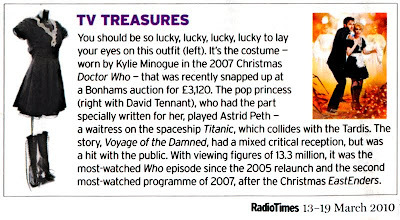 This week’s Radio Times marks the first item from the recent Bonhams Auction to appear in their tv Treasures feature. The first item chosen is Kylie Manogue’s Astrid costume, which fetched £3,120. It should be pointed out that the boots were found to be labeled “Stunt Double”, so there was an ounce of doubt that Kylie had actually worn this costume. Didn’t deter the bidders though!